Thanks Wonko, may I get some help about primary partitions size distribution where I have reserved starting 64GB for them all. What I expect to boot from the drive is Win 8.1 installation media,optionally Win 7 installation media and about 20 bootable ISOs. I'm not too clear where the Win 8 installation comes. Does UEFI_MULTI handle BCD entry for it's environment or do I have to add it self using EasyBCD? The FAT32 Set Active Boot partition should have size smaller than 32 GB e.g. 20 GB so that you can use FAT32 Format. The Win XP/7/8 Setup ISO files used as Installation media should be copied to the DATA partition. These Setup ISO files have no BCD entry in USB FAT32 Boot Drive. After booting from USB you can use portable App WinNTSetup3 to mount the Setup ISO in ImDisk Virtual Drive. BOOT_IMG can make Grub4dos Menu on Boot Drive for VHD Image Files copied to Target System Drive. Then prepare Multi-Boot of Fedora-18 + Windows 8 from USB-harddisk as follows. Existing file /efi/boot/bootx64.efi of Windows 8 is renamed as 8bootx64.efi to enable Multi-Boot of Win8 and Linux. Folder efi with Fedora-18 Secure Boot files is copied from UEFI_MAN to USB Boot Drive. and we use Fedora vmlinuz0 and initrd0.img in LiveOS folder of Fedora-18 copied to USB Boot Drive. Windows 8 should NOT be default. quiet = hides the majority of boot messages before rhgb starts. These are supposed to make the common user more comfortable. So that I have to use BOOT (the FAT32) partition smaller than 32GB? That may be reason it didnot offer me g4d boot menu at all. My initial layout Boot/System/Data was 40 / 16 / 8. Even when I had selected USB storage with higher prio than internal HD it jumped directly to external Windows Bootmgr-based menu and offered me only systems which I've added as .WIM image (all ISOs registered via menu.lst, however grub4dos seems never been invoked). If I choosen UEFI USB Device from Windows 8.1 boot menu, it just restarts. BTW. 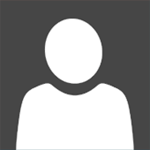 Mark partition as active/inactive option is not available for partitions on GPT drive. Is that problem? Edited by Franz Ferdinand II., 24 April 2014 - 09:29 AM. If you have UEFI firmware then for booting Grub4dos from USB you need to modify BIOS settings. GPT cannot be used on BIOS computers and probably also NOT on UEFI computers in BIOS mode. Win8.1 SE boot.wim can boot directly from Boot Manager Menu without changing BIOS Settings. So in simple, there's not yet a way to create multiboot partition on GPT drive, right? If that conclusion is true, is that possible create more smaller partitions on GPT drive, one bootable WinPE-based environment per partition, and modify main BCD accordingly? 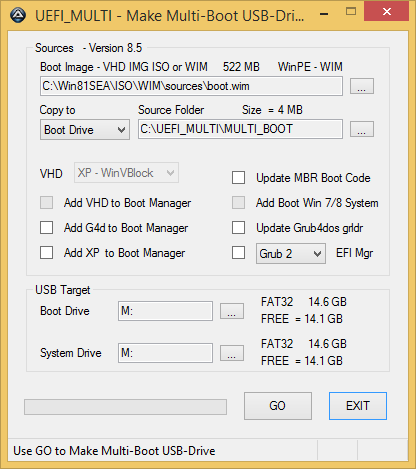 You can have several WinPE boot.wim files (having different names) on the same FAT32 Boot partition. boot.wim is a container so there is no need at all to create more smaller partitions. In command window of Win8 then run bcdedit to view the created entries e.g. will give the entries e.g. This is a major (and may be final) Update to version 8.5 for all programs derived from IMG_XP project. For UEFI + BIOS booting from USB then Windows 8.1 x64 need to be used as Source. you can use portable App WinNTSetup_x64.exe to mount XP/7/8 Setup ISO in ImDisk Virtual Drive. since it can be used portable from USB without requiring extra drivers or software on the host computer. Is there any other source available from where I can dowload this file?? It is a false positive warning of your AV Software. I have the same here for AVAST AV Software. I've been looking for a solution that me free from CDs, in which I can do everything with my external HD. My only problem was with UEFI, since no Multi_boot boot in UEFI. I wonder if I can and how to put the recovery of more than one type of Windows 8 (Windows 8 SL, 8.1 SL and 8.1 Pro for example) in UEFI mode and if I can put in BIOS Mode the Hiren's Boot, Windows 7 and XP. At the BIOS mode, I can use it to boot another MULTI_BOOT? Sorry for so many dumb questions and the bad english. Edited by MaxPresi, 25 August 2014 - 10:04 PM. i'm try to combine a uefi multiboot usb of windows 7 and windows 8.1 at the same usb disk, but everytime i choose the iso file, i get an error message that says incompatible format of iso, too large for fat32. how can i solve this limination and combined both operating systems with this tool or another tool? 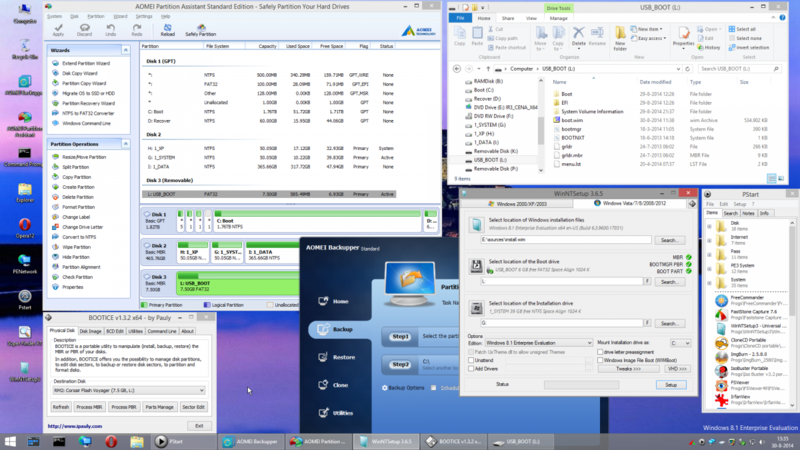 i'm using winsetupfromusb that is very easy to use and created a ntfs partitions for all my iso's, and i'ts working great, but not on uefi systems. Instead of FAT32 USB-Stick you should use Portable USB-Harddisk with 3 partitions according to description. I was wondering where to put grub2 modules? "Failed to verify image with *ACCESS DENIED*"
In my case UEFI Secure booting of 8.1SE x64 WIM from USB-stick is doing fine. Did you use Win 8.1 Enterprise Evaluation ISO to prepare 8.1SE x64 WIM and what is the precise version nr e.g. 9600.17050 or 9600.16384 or .... ? Also you might try to use F8 key to select 8.1SE x64 WIM and so use Advanced Boot Options, where you select Disable Driver Signature Enforcement. Try the above and report about it. I would like to share my findings about UEFI boot with Secure Boot enabled. Assumption: some knowledge on UEFI boot. I followed wimb's UEFI_MULTI method with success, however I had problem with Secure Boot enabled. In wimb's method Parted Magic has to be run with Secure Boot disabled. when Secure Boot is enabled, requiring copy from /EFI/Microsoft/boot/bootmgfw.efi to /EFI/bootx64.efi. like Parted Magic, Ubuntu 14.04..., without changing anything. The method is taken from AltLinux. You have to adapt the configuration files (refind.conf, elilo.conf). append="root=UUID=b08a3f56-9df0-4a91-b7a5-27b854f2b5d8 ro  quiet splash $vt_handoff"
append="edd=off load_ramdisk=1 prompt_ramdisk=0 rw vga=normal loglevel=9 max_loop=256 vmalloc=288MiB directory=/ keymap=fr"
So Easy2boot still has 4th primary partition to work. Important: the NTFS partition needs to be primary and not logical, because if logical, the VHD files will not be found in UEFI mode (no BCD entry displayed for them, while in BIOS mode there is no problem). This is a bootmgr "feature" that caused me a lot of time to figure out. Note: in BIOS mode, BCD is /boot/BCD, in UEFI mode, BCD is /EFI/Microsoft/boot/BCD. If you enclose the hard disk with Zalman VE-300 (ISO emulator) or similar, your multi-boot USB hard disk (2"5, could be up to 2 TB) would be very useful. It can be booted in BIOS mode where is Easy2boot is presented, and in UEFI mode (Secure boot enabled or not) where rEFInd UEFI boot manager appears. For difficult boot cases, you can cheat and use Zalman ISO emulator. It fulfills my dream having an "universal" multi-boot USB hard disk without requiring to change computer setup ("BIOS") to disable Secure boot and/or to enable CSM (legacy) mode. hi ktp, good to see your still around! that is ALOT of useful info. it looks like exactly what is needed too for if/when I ever get UEFI system. actually, I wouldnt have even considered one until now since reading your post here! Hi to all I want to run slax in uefi mode/secured boot is this uefi multi applicable? Can some share the link or procedure? Any chance this can be updated to make use of UEFI:NTFS? It works great as is, but it would be nice to be able to use images larger than the 4GB file limit in FAT32. Basically it creates two partitions, an NTFS and a FAT one, the NTFS gets ignored on 32-bit systems with EFI and the FAT one contains relevant boot code to load the NTFS one and boot from it.